After visit to Tehran Amano says 'work will be needed,' in indication his mission to probe military nuclear program did not advance. 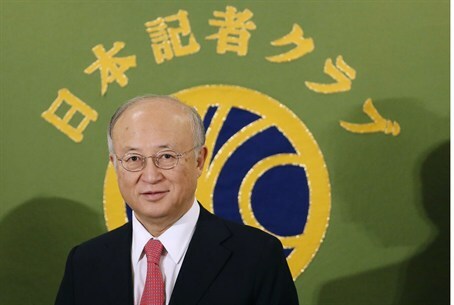 Yukiya Amano, head of the UN nuclear watchdog International Atomic Energy Agency (IAEA), revealed on Friday after visiting Iran the day before that more work will be needed to achieve a nuclear deal. “I believe that both sides have a better understanding on some ways forward, though more work will be needed,” Amano said in a statement, reports AFP. He had gone to Tehran on Thursday to try and tackle the military aspects of Iran's nuclear program, as the clock ticks on an extended July 7 deadline next Tuesday to conclude negotiations and reach a deal. Meanwhile Russia's chief negotiator said Thursday that a nuclear deal with Iran is "91% finished" and that a deal will be reached before the deadline. Amano was trying to advance an IAEA probe on charges that before 2003, and likely since, Iran researched the development of nuclear weapons and not "peaceful" nuclear energy as it claims to be developing. His statement that "work" remains would seem to indicate that his effort to clarify Iran's nuclear past was unsuccessful. Suspicions have been raised by Iran's numerous covert nuclear facilities, such as the Parchin military base where Iran has already let slip that it tested exploding bridge wire nuclear detonation devices. The IAEA said as early as last November that Iran is refusing to answer questions on the military aspects of its program, and recently indicated that the probe is essentially stalled. Iran has stated it will not allow inspections of its secretive nuclear facilities, which is one of the major sticking points in the upcoming deal.